Jessica received her PhD from University of Florida and is now a postdoctoral researcher at Louisiana State University Museum of Natural Science. 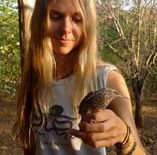 Her research focuses on how historical geologic and climate change caused extinction, extirpation, and diversification in Neotropical birds. During her time at UF, she have served as President and Vice President of the Biology Graduate Student Association.